It's simple: China is getting richer…and its women are getting more educated. According to the CIA, the five countries with the highest birth rates in the world include the likes of Niger, Mali, and Uganda. There's a clear correlation here: these countries have some of the lowest per capita incomes in the world – the average income in Niger is just $800 a year. Now let's flip the numbers. The five countries with the lowest birth rates in the world include Monaco, Hong Kong, Singapore, and Japan. Now look at the average incomes. Monaco? $70,700! Singapore? $61,400. China clearly aspires to be in Monaco and Singapore's company…not Niger and Mali. In addition to the wealth effect, studies show that the more educated women become, the less likely they are to have more children. This has happened across the world, in Europe and even in traditional Asian societies like South Korea. China is the great historic anomaly. China's citizens have gotten as old as Europeans, well before they've reached European levels of wealth or education. And while China is not as rich as South Korea or Singapore, it has high and ever-increasing female literacy – the rate is now nearly 93 percent. So getting them to have more kids now might not be that easy. Why is China an anomaly? Well, it's the only country that could pull off a central edict like the one-child policy. It was an unprecedented experiment in population control. The problem is that now China really needs young people – by 2050, about a third of Chinese will be over the age of 60. What can Beijing do? Well, it is probably looking at experiments in the Western world. Consider France, which in the 1990s realized it needed to boost fertility rates. The central government put in place a program of incentives including tax breaks for parents, subsidized housing, and access to child care. According to the Wall Street Journal, France spends 4 percent of its GDP on these programs – about twice as much as other rich countries. What happened? France's fertility rate over the last 20 years rose considerably, from an average of 1.65 children per woman in 1994, to two children per woman last year. That's a 20 percent jump. 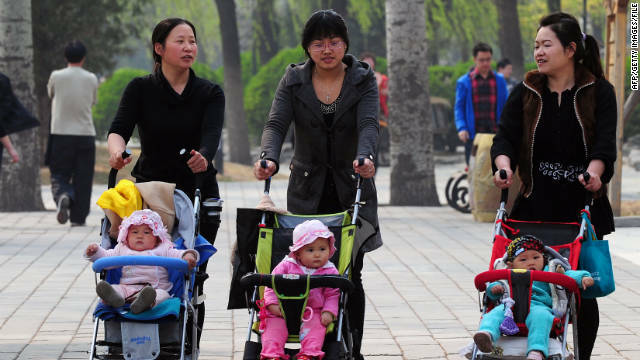 If China wants its people to have more children, it may have to do a lot more than minor relaxations of the one-child policy. It might have to go in for a French solution. So very true @ MiLin and children are also a gift from God! And @ Ken Margo, you might as well save your breath because THEY are right...its the whole rest of the world thats all wrong doncha know? Lol and yea im being sarcastic of course! One country that doesn't fit the equation is the Philippines and that's right in China's backyard. Why wasn't that country used as an example . . . of things that don't work! For one thing, on paper the average literacy rate is quite high in the Philippines, but it takes more than that to get women to focus on better lives rather than have children, with most being born out of wedlock. Catholicism is certainly a major culprit in the Philippines, combined with the fact it never had a unifying "culture" and a defined objective. What characterized the Philippines "culture" is the lack of several elements that make a society work effectively at all levels and in all areas, including population control. Here are some of them: religion (Christianity, which remains dominant in every poor Christian country, just as Islam keeps poor Arab nations ignorant), a sense of responsibility, accountability, an ability to think and reason for oneself, a willingness to elimination much of corruption at all society levels, elimination of an education system that is a perfect replica of 16/17thth century Christianity with obsolete religious values and dominance of the church in all national and family debates with stress on pro-creation, an end to nepotism which is the most prevalent feature of this society, which leads the better educated people (without family connection and wealth) to work for multinational companies or go overseas . . . . China doesn't seem to be paralyzed by those handicaps and there is every reason to believe that they can be as successful in achieving the same kind of success with their family planning programs as they have been with their economic performance. 11/3/2016 @ 19:38:19: Thanks for the post globalpublicsquare.blogs.cnn.com!